It’s well known that RancherMan loves bread. A LOT! I strive to keep him supplied in the soft & fluffy Sandwich Bread he loves. And of course I’ve got other bread recipes in my arsenal too. We love quick Beer Bread or spicy Jalapeno Cornbread. And I’d been making cast-iron baked Boule Bread too. But that recipe requires you to heat a flat pan at the same time as you preheat the oven, tossing in water at the last minute to create steam. That steam got between two glasses of my oven door & it’s nigh impossible to clean without disassembling the whole oven door! 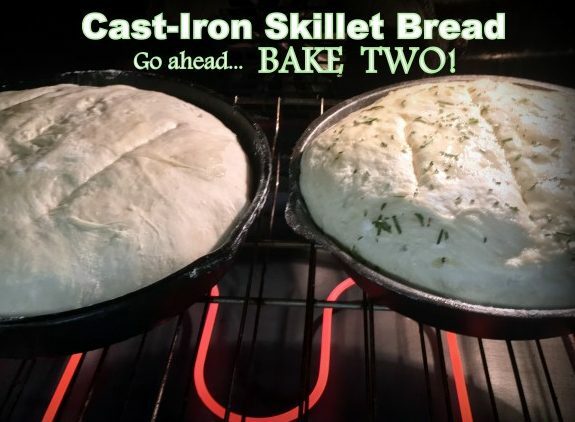 So I’m looking for an easy no-knead skillet bread recipe that doesn’t require that step. 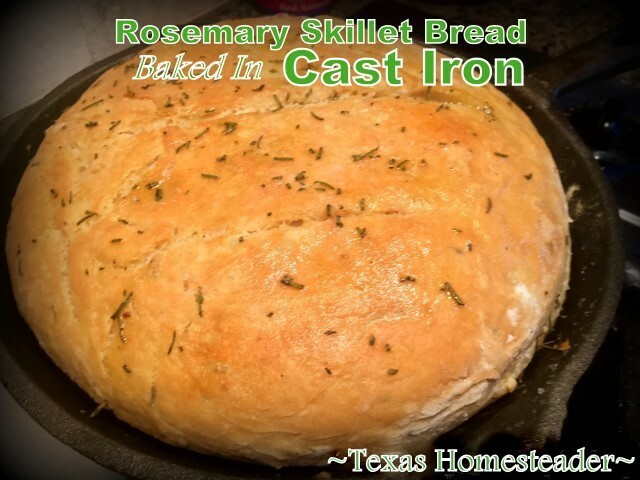 Then I found an even easier recipe for rosemary-flavored skillet bread. And heck, I’m able to flavor it with minced fresh rosemary from my garden. Y’all know an easy no-knead stir-rise-bake bread recipe will be a fave in the Taylor kitchen! I found this recipe over at Baker Bettie and sat out to see how well it worked in my own kitchen. I will admit that it’s not only super easy, but both RancherMan & I love this bread! This bread is also perfect for tearing off pieces and dipping into flavored olive oil. Sometimes I’ll make the flavored olive myself by infusing a bit of olive oil with pressed garlic, herbs & a pinch of salt. It makes the perfect flavorful dipping oil and it’s cheap, cheap, CHEAP! But you know me, if I’m gonna have that oven fired up I’m gonna put it to good use! So I typically double the recipe and pull out both of my 10″ cast-iron skillets instead of just one. Then one loaf will just be topped with olive oil and coarse salt & I’ll garnish the other one with fresh minced rosemary. Something for everyone! I’ll share the recipe below, but I highly recommend you do as I do & double the recipe! 2 loaves for near the same effort as 1? Yes please! Combine yeast, warm water & pressed garlic in a large bowl. In a separate bowl, mix flour & salt. Stir until combined. Stir the flour into water mixture one cup at a time & mix until completely incorporated. Cover dough with greased wax paper (I use the bowl's lid that is not snapped completely tight.) Allow dough to rise for 1 hour. Lightly oil the bottom of a 10" or 12" cast iron skillet. Do not punch down the dough but sprinkle flour on top of the dough (it will be sticky). Cover hands with flour & quickly, roughly shape dough into a flattened circle. Quickly scoop up shaped dough & place into greased skillet, pressing sides to reshape if necessary. Cover loosely with a greased wax paper, and allow to rise 30 minutes. Drizzle olive oil on the dough & make a couple of slashes in the top of the dough with a knife. Sprinkle top with coarse salt and minced fresh rosemary. Bake 35-40 minutes, or until the top is a nice brown color. Remove from oven and let cool in pan 5 minutes. Looks Wonderful and will save and make real soon. Thanks 4 sharing. Other day I had made cheddar cheese & dill bread. That really sounds good I love Balsamic Vinegar and oil… Still looking for a good cast iron skillet to use. I wanted to make a loaf this morning for lunch, but there’s something missing. When is the garlic clove added? It’s listed as an ingredient, but the directions never state when to add it to the dough.